Yesterday Akshaya came back from school complaining of a sore throat and runny nose and honestly I wasn’t all that surprised. She tends to catch a virus the second week into school so this year I was prepared with all the ingredients I needed to make soup. My daughter loves soup unlike her mother or brother, so when she does get sick all she requests is a warm bowl of soup or chicken yellow curry. 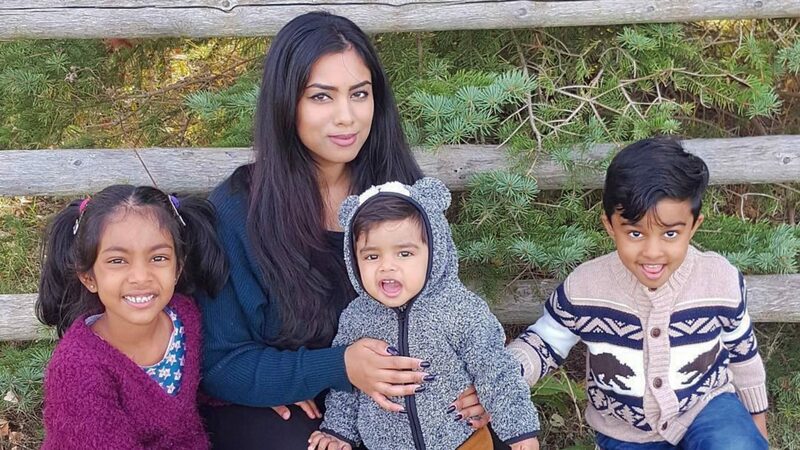 Akshaya is not a huge fan of chicken noodle soup, instead she prefers whole-bodied soups with a lot of ingredients and flavours. Her favourite soups are chicken rasam ( a spicy Sri-Lankan soup). shrimp and lemongrass soup, and of course this vegetarian pho which I sometimes make with chicken. 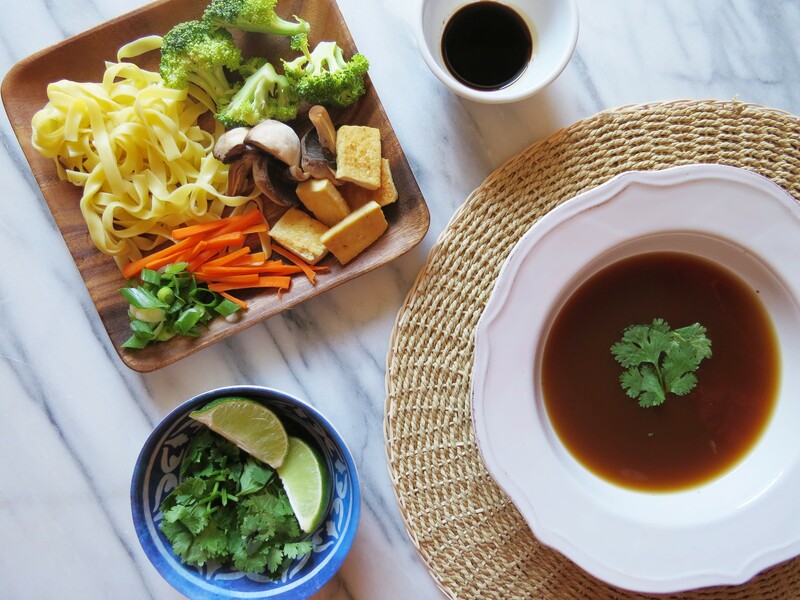 Pho, a Vietnamese noodle soup, is actually a recent thing in our household. Traditionally this soup is made with spiced beef broth, rice noodles, beef, and a few herbs but it so versatile in that it can be made with whatever groceries you have on hand. The recipe below is my vegetarian take on this popular soup. 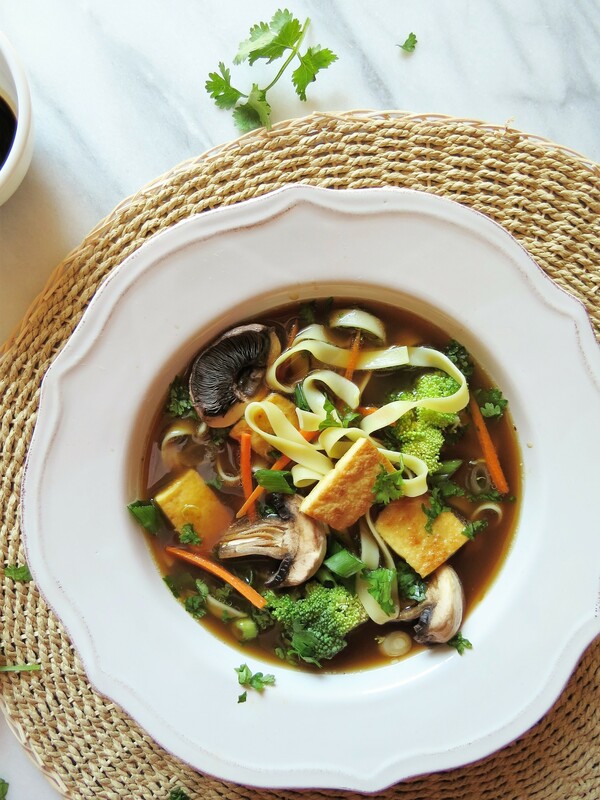 I use vegetable broth and add a lot of veggies and tofu for protein. 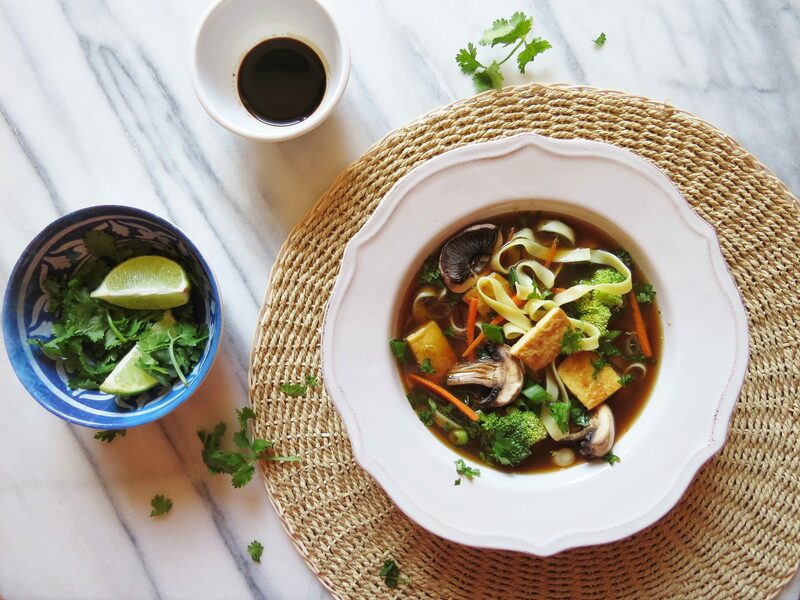 The kids love this soup because they get to choose which vegetables and toppings get added in their bowls of broth and noodles. Lightly coat the onion and ginger in sesame seed oil and broil in the oven until the onion is charred but not burnt (approximately 5 minutes). In the meantime, dry roast the coriander seeds, fennel seeds, cinnamon, cloves, star anise, and cardamom on low heat until the spices turn a shade darker and release their aroma. In a pot, add the vegetable broth, whole roasted spices, coarsely sliced carrots, red pepper, broiled onion, and ginger. Cover and bring to a boil on medium heat. Let the broth simmer for 30min-45min, then carefully strain it into another pot. Add the soy sauce, lime juice, and honey. Check seasoning and adjust accordingly. Cook the noodles according to package directions. Drain, and toss the noodles in 1 tsp of seasame seed oil for both flavour and to help keep them from sticking to one another. Lightly coat a non-stick pan in oil and stir-fry the tofu pieces until golden. Set aside. If preferred, the broccoli and mushrooms can be blanched (immersed briefly in boiling water). We keep it raw and add it to boiling broth. By the time the soup is ready to eat, the vegetables are soft enough to eat but still crunchy. To serve the soup, divide the hot broth amongst four bowls. Add noodles, broccoli, mushrooms, carrots, tofu, chopped herbs, scallions, lime wedge and chillies if desired. This soup can easily be made with beef or chicken broth, and meat. 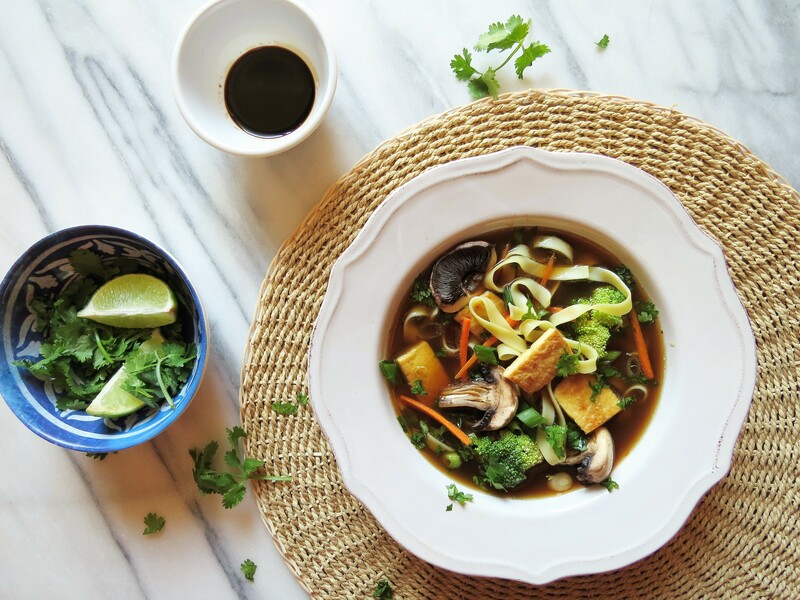 Other vegetables that would work in this soup include: shredded Napa cabbage, bamboo shoots, baby bok choy, and Chinese broccoli. The spiced broth is the star of this dish. To learn more about the spices used and how they help battle cold and flu symptoms click here. If you give this recipe a try, please let me know what you think in the comments below. I would love to hear your comments and suggestions!